Lanvin Oxygene Homme is a fragrance with a fresh and sensual scent. 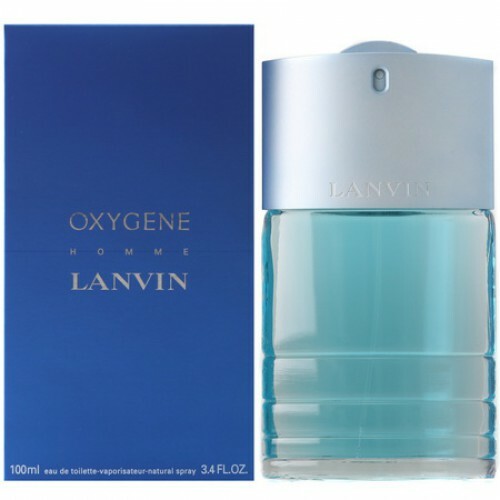 Lanvin Oxygene Homme 100ml. Eau De Toilette is a fragrance with a fresh and sensual scent that combines fresh and spicy tones, according to men between the ages of 25 and 35. The fragrance begins with tones of cedar and cypress wood, then follow the fresh flavors of coriander, juniper, resin and white musk. For this product, Lanvin has created a modern scent, refreshing and full of masculinity. unusually fresh Perfume for Men, created by the French women's fragrance in 2000, called Lanvin Oxygene and the creation of which he had a hand Alberto Morillas. New wood - aromatic composition created for men living in the modern metropolis. Like a breath of freshness explosive cologne gives extraordinary feeling of lightness and vivacity. Flavor tones and gives positive emotions. If the morning starts with a cool shower and Lanvin Oxygene Homme, then the day is sure to be successful. It has already been tested by thousands of fans composition Lanvin Oxygene Homme. Indeed, such a perfect scent for everyday life are hard to find, but thanks to the company Lanvin this problem no longer exists. Find the perfect men's French flavor for spring - summer. And it - Lanvin Oxygene Homme. Perfectly harmonious and balanced mix of forest and meadow chords - smells of the forest and cut grass, morning dew and needles - all blended with oriental spices. Starting composition and experience the oxygen cocktail, where notes of coriander and complemented resinous notes of Sicilian fir and cypress. Fragrant gives extra flavor boost, because it has vitamin C. Green coriander gives sharpness and maturity fragrance. Oil fir has fragrant pine smell and gives extra freshness. Elegant cable with undertones of musk and cedar unobtrusive and pleasant. Description compositions Lanvin Oxygene Homme : ekstragon, Sicilian cypress, coriander, fir resin, juniper, myrtle, Atlas cedar, white musk.